Fiery Color ProfilerEFI™ has announced the availability of Fiery® Color Profiler Suite 4.0, which it said has been specifically designed to deliver precise colour matching even for novice operators. It includes innovative spot colour optimisation features and the brand new EFI ES-2000 spectrophotometer to measure colour from any paper type under any lighting condition. "Consistent colour quality is a top issue for us and our clients," says Marc Finkel, founder of Influent Solutions in Las Vegas. "Fiery Color Profiler Suite is a comprehensive suite of colour management tools that solve these problems, and the new features in version 4.0 will help make accurate colour reproduction even easier." EFI highlighted the fact that with Color Profiler Suite 4.0, even less experienced users can produce colour profiles that allow them to quickly and easily meet customer expectations for colour precision and accuracy on an expanded range of supported printers. These include Fiery-driven wide-format inkjet printers for proofing and production. The new suite is now integrated at every stage of the Fiery workflow, and includes a free three-month subscription to Fiery Dashboard, a cloud-based solution that reports metrics including colour quality with tracking and trending tools that compare colour accuracy and variation among print engines over time. "In an increasingly competitive and demanding digital printing environment," said John Henze, vice president of marketing for EFI's Fiery division, "EFI is committed to bringing to market innovative tools and solutions that will differentiate print service providers and improve both profitability and their ability to garner the utmost in client satisfaction. 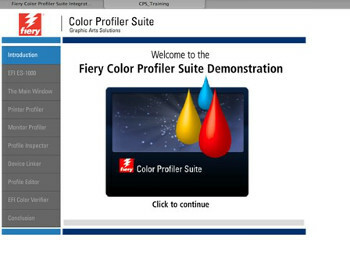 Fiery Color Profiler Suite 4.0 and its integration with Fiery Dashboard is evidence of that dedication in action." 40 Inch Sheetfed Press – That’s Digital! New stretchable UV ink from Mimaki brings the benefits of digital printing to vacuum moulded, or thermoformed applications. Caprice Helps To Create That’ Wow’ Effect! 3D Printing Isn’t Rocket Science. Or Is It? A New Record in 3D Printing from Object!